Recently Facebook has officially released the Facebook Timeline all over the world. 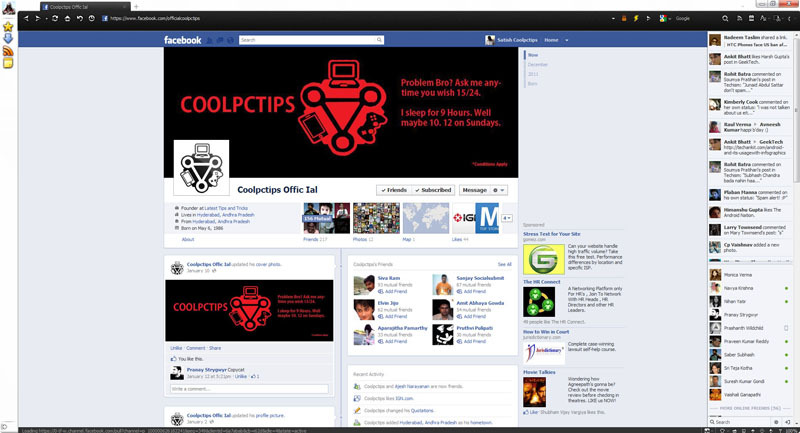 The latest feeds and updates are displayed in the form of Facebook Ticker, also the chat box is completely changed. Well, this is not at all that impressive with some browsers. Recently i was checking my facebook timeline in some browsers and was finding which browser will suit my screen perfectly. To my surprise almost all browsers have the same layout and design which is not that compatible with the facebook ticker and chat box. The worst part which i don’t like in many browsers is, it combines the Ticker and Chat box in a single column and gives us a option to manage yourself. It may be the length or width of the Ticker and Chat box, you have to fight your own battle with them. I have checked Facebook timeline performance in almost 8 famous and latest browsers. But one browser has got all that amazing stuff which i needed in my browser. Specially when i use my Facebook account regularly. 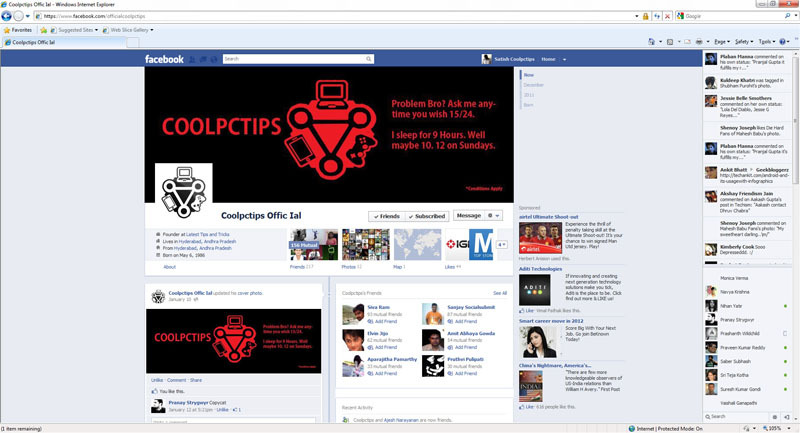 Check out some screenshots below where i have mentioned the compatibility of Facebook in each and every browser. 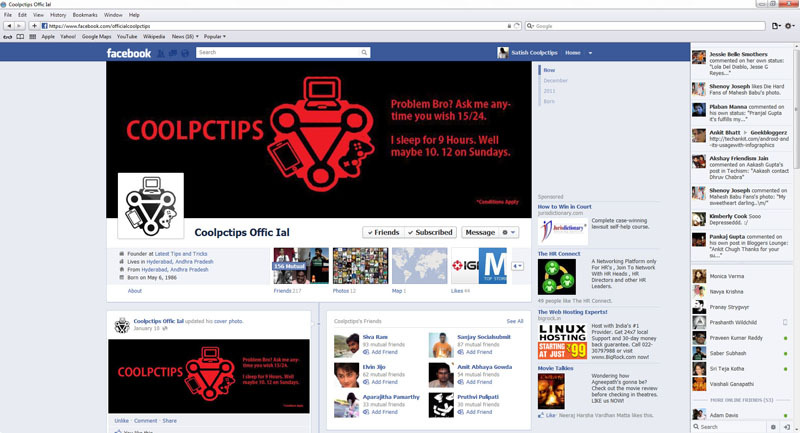 I have made my own custom list among all the best browsers in world which support Facebook. You may be having a maximum of 2 to 3 browsers in your PC. But if you are a regular user of Facebook and don’t want to face these Facebook Ticker and Chat problems, I would suggest you to get any one of the top 3 browsers mentioned below. But after reading the review, you will go for the first browser for sure. So, lets take a look at the list now. 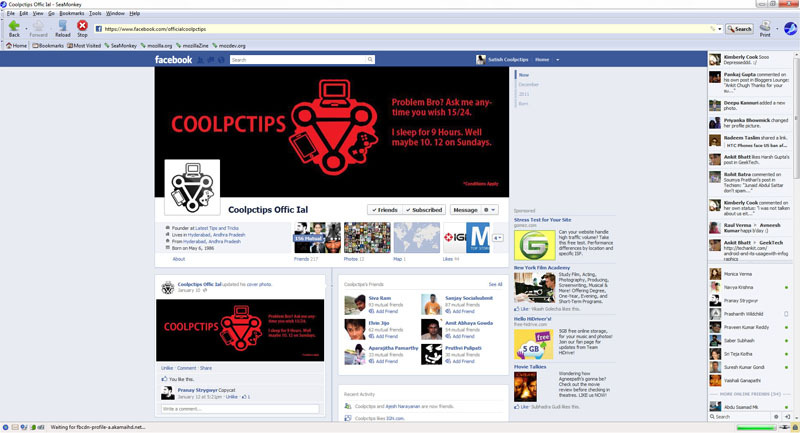 Rockmelt is an amazing browser which is super compatible with new Facebook. 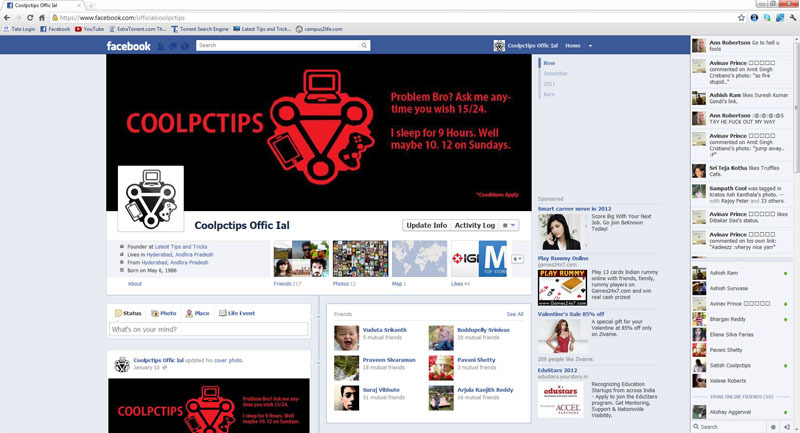 You will love to use this browser if you want your Facebook to be the active part of your life. The amazing options in this browser will make you stay updated for each and every update happening in your facebook account. It will keep you busy chatting with your friends, watching the ticker and following the updates regularly. The response time of this browser is really good. The best part of this browser is, you can chat with your friends and keep updated with the facebook feeds, no matter what ever site you are browsing. Once logged in, you will get access to Facebook chat and other requested feeds any where in the browser. 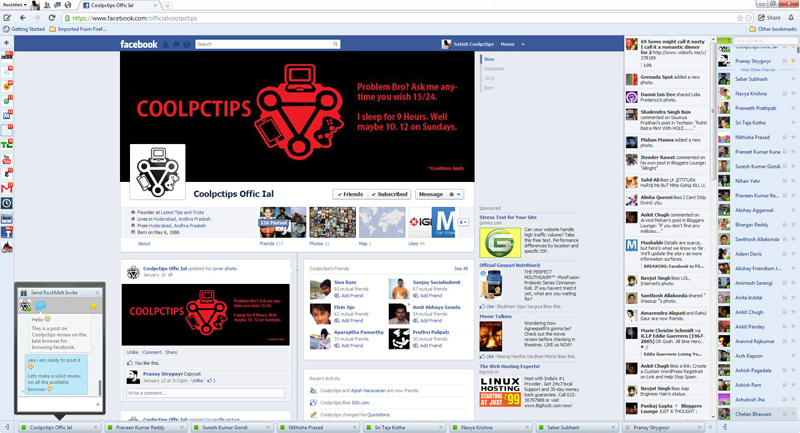 Check out the layout and exact match for the new facebook ticker and chat. You cannot find the same layout and compatibility with any other browser in the world. This is the way Facebook wanted its users to experience the new Facebook Timeline, Ticker and Chat box. The image showed above in taken in a 23″ Full HD monitor. The browser is best seen in a 1920 x 1080 resolution screen. Not only in this resolution, you can find the same layout and design in any normal monitors with good resolution. Since most of us use less resolution screens, you may be not finding Facebook to be more interesting. You can observe a lot of changes in this browser. We have already written a detailed description about Rockmelt browser in our previous articles. Normally if you are browsing Facebook in your other browsers, you may observe that the feeds are not notified regularly to your account. If you are using Maxthon, then you may not find this problem at all. It will keep you updated for each and every notification regularly. The refresh and response rate of this browser is amazing. You will find the browser to be light and fast. 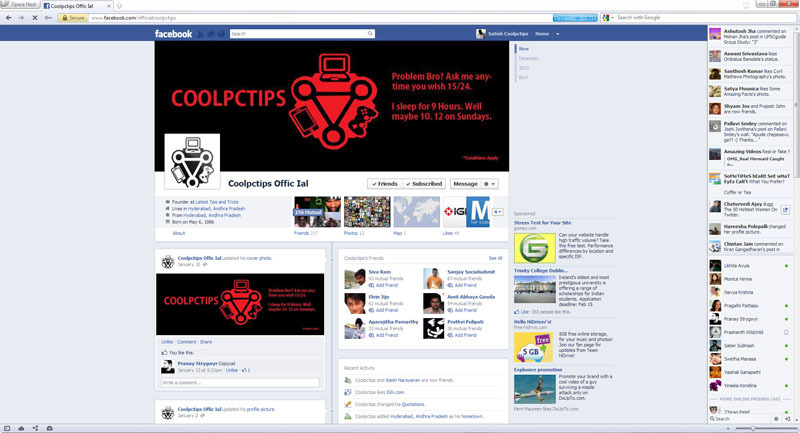 There are few options in Maxthon where you can download all the images and videos of a page in Facebook. You will find an option where you can download all the images, videos, sounds with a single click. Opera will load Facebook a bit slow. But once loaded, it will give you good navigation to all the pages. You will like the quick zoom option in Opera if you are having a big screen. The chat box is very neat and loads quick. Absolutely perfect if you want to multi chat with more than 3 people at a time. Try it out in the latest version of Opera 11. Even chrome is a bit okay when compared with other browsers. You will find the browser to be very light with Facebook in it. Try to chat with your friends from Chrome, you will be active even if you are not in the Facebook page. Which means even if you close the Facebook page without logging out properly, your friends can still see you online and will send you messages thinking you are online. So try to logout completely if you are using Facebook in Chrome. You will love Safari browser if you are having a good bandwidth and good processor. If you open Facebook in this browser, you will observe the Facebook will to be very accurate if you are requesting something. 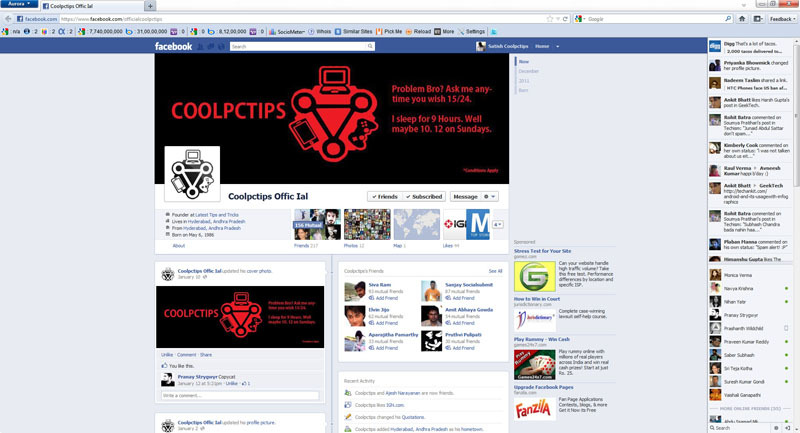 The layout and the proper fitting of the browser will make you feel better when browsing Facebook in it. Try to use Safari for a while, and you will never use any other browser for your regular activities. Facebook is visually very rich in the latest Safari browser. The new Firefox Aurora is very fast if you are trying to open your Facebook account when your PC is filled with other processes. Means, if you have too many applications running in your PC, then try using the Aurora Browser, it will take less process speed and keep you updated with your Facebook notifications. The refreshing speed and response time is not that impressive compared to others, but you give it a try. Internet Explorer is not that impressive when you are using Facebook or any other social networking sites in it. The loading time is not that impressive, and also the refresh rate is not that good. If you are using slow systems, then try using IE browser. It will be good if you are using normal bandwidths. It doesn’t require much process speed or much space to keep you updated. This browser is very simple and loads super fast. You no need to use keep refreshing your page regularly to keep your notifications up to date. The loading time is really good when compared to few browsers. Browsing Facebook in this browser is real simple. You will not enjoy using Facebook in this browser, but will have a real experience of using it fast and neat. These are the best browsers which will make your Facebook browsing real simple and real interesting. I personally recommend you to use RockMelt, Maxthon or Opera 11 to enjoy your browsing. If you want your browser to use less process speed and keep you updated, then use Chrome of Sea Monkey browsers. Leave a comment or if you got any doubts on the all browsers post. In your opinion Which browser is fast ? is Maxthon browser fast like Chrome? I love chrome but i will give maxthon a trial. Safari is owned by Apple and it originally works on Mac OS X only, but in 2007 when Safari 3 is released/announced, it works with both Windows and Mac OS X.